We all have times when we need to carry some medication tablets, extra paracetamol to ward off the headache from just a tiny bit too much last night or to keep our stash clean and away from contamination. Well this Cheeky One Air Tight Stash Pot is perfect for all those occasions and what is more it can be kept secure on your house, or car key ring. We offer these in two handy sizes the smaller of the two exterior dimensions; 21mm diameter, 47mm high, the larger has exterior dimensions; 46mm diameter, 80mm high. Now we find that the smaller one is perfect for the key ring, but we would suggest that the larger one is better suited for when you are travelling with a bag, users find that it too big to carry comfortably in a pocket. 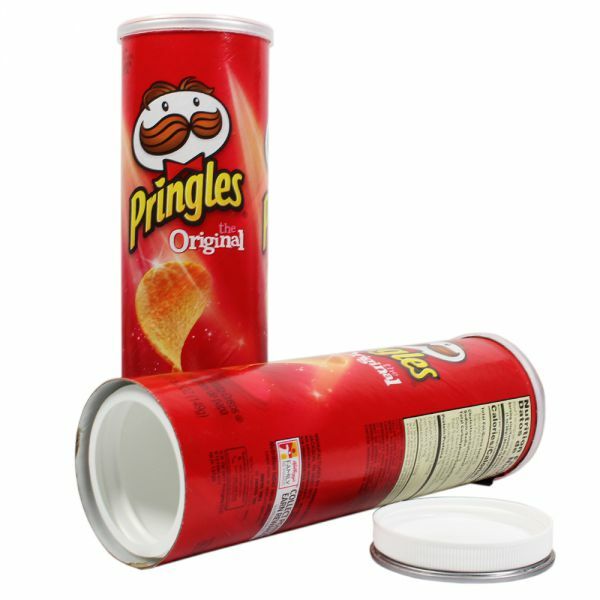 These stash pots have a rubber seal around the lid that helps to protect the contents as well as helping to contain any smells. 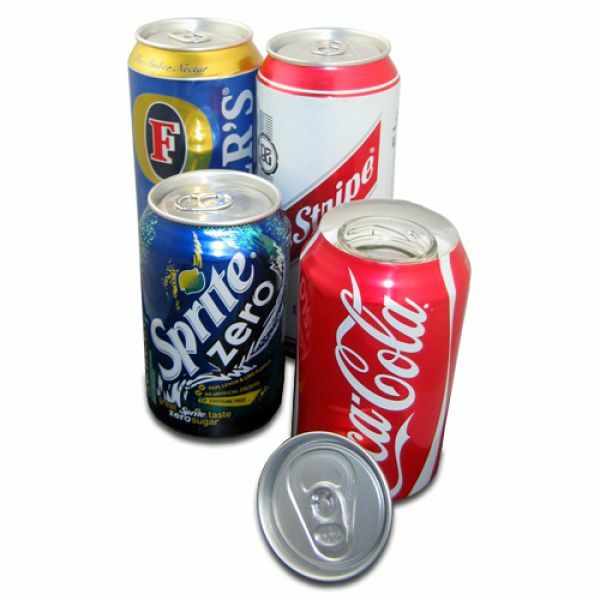 The smaller version we offer in four distinctive colours, blue, black, red or silver priced on our web pages at just £4.99. 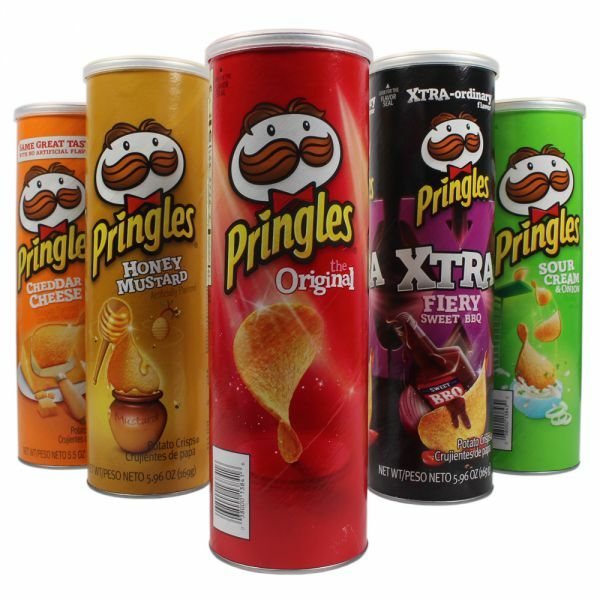 The large option is supplied in five colours, blue, black red, green or silver and these are offered at only£7.99. These are the perfect pots for keeping your medication or keeping your herbs fresh and unwanted odours out, when out and about. There cannot be many of us, that is if we are being completely truthful, that have not have run out of cash, or not had enough money to buy the last round of drinks, maybe had to walk home because the few coppers we have left would not get us far in a taxi, and the note that we though was tucked inside our sock is no longer there! 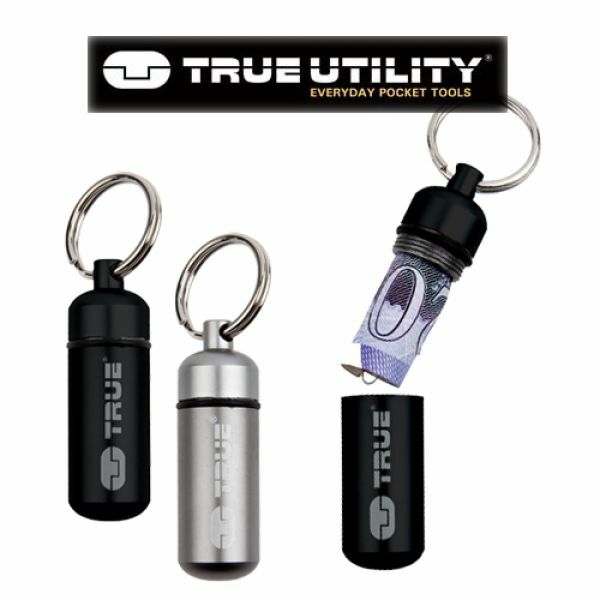 True Utility has solved the problem for us all with their neat, simple, but clever capsule. The True Utility Cash Stash will make sure you never run out of money again. Manufactured using high quality aircraft grade aluminium, complete with a waterproof neoprene ‘O’ ring, it will clip onto your car or house keys, no excuse to leave home without it! The design is completely waterproof thanks to the neoprene ‘O’ ring, ensuring that currency notes are kept both dry as well as safe, it also provides a money clip within the capsule to help roll a £20 note, which will then fit easily into the Cash Stash. We offer this neat capsule in either gun metal grey, or black for just £5.99, a one off peace of mind insurance for less than the price of a couple of pints! There are some items which all of us want to keep safe from microorganisms, children, thieves, moisture, sunlight and the air we breathe, for example herbal products, medication and valuables. Medication is a prime example and although this often comes in a bottle or container that is claimed to be child proof, but watching his daughter is what led Graeme Gordon to come up with the SneakGuard Safe. He found that his daughter was able to open a child resistant bottle of pain killers, which at the right dose can be lethal. In this case thankfully, he was at hand and nobody was harmed. 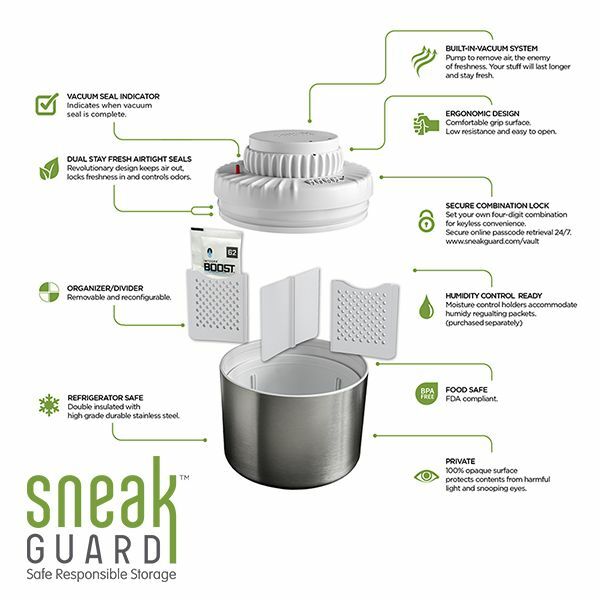 SneakGuard will do the job and is guaranteed to keep little hands away from the contents, it is a generous 1.5 Litres in capacity, has a 4 way divider with the ability to store 2 way humidifying packs to help keep the contents at the perfect moisture content. Manufactured from high quality stainless steel, completely refrigerator safe, your valuables will be kept safely stored away and safe from degradation and snoopers. The inside is also made with stainless steel and will provide a safe double insulated storage for your items. So for peace of mind storing your medication or herbal products is as easy as placing them into the SneakGuard, twisting the lid to seal, pumping the lid to remove air and vacuum seal, and then lock by using the combination lock. This item has recently arrived and we are very excited about it and rightly so, it is the latest vacuum sealed system to arrive from our friends at TightVac. 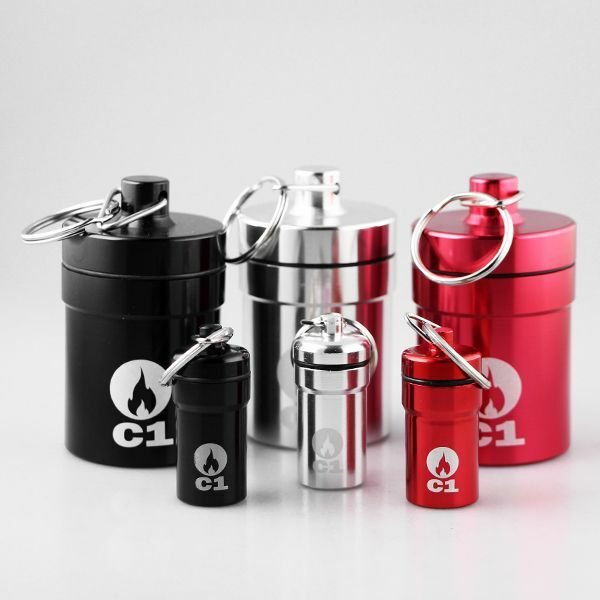 Although it is specifically designed for herbs and tobacco, it has many other uses, but with the unique vacuum sealed system, which is designed to keep your products as fresh as the day that they were bought, we believe that you will be excited too. The Space Vac works by keeping the herbs and your tobacco fresh by restricting oxygen to the container and not allowing them to be contaminated with smells. Some of the other uses that the space Vac can be used for include pills, prescription drugs, coins and perhaps a few sweets! A handy size at 0.6 litres, it measures one inch high by two and seven eighths inches in diameter so it is handy for the pocket or handbag when out and about. The Space Vac Container is offered by us at just £6.99 and can be supplied in either opaque or clear, ideal for a portable addition to add to the collection of containers for keeping your herbs or tobacco clean and fresh. 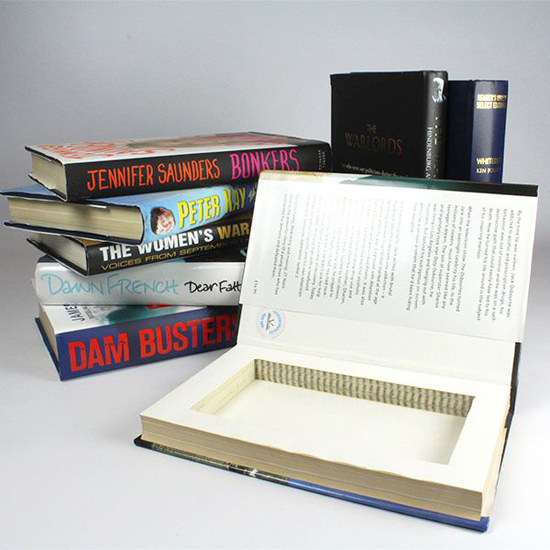 Keep your valuable safe from those prying eyes by placing them in the most obvious of places, in a bookcase or a shelf with some interesting novels neatly on display! We have a number of clever devise on our web pages which are designed to keep your valuables out of the reach of thieves, well in sight but safe. 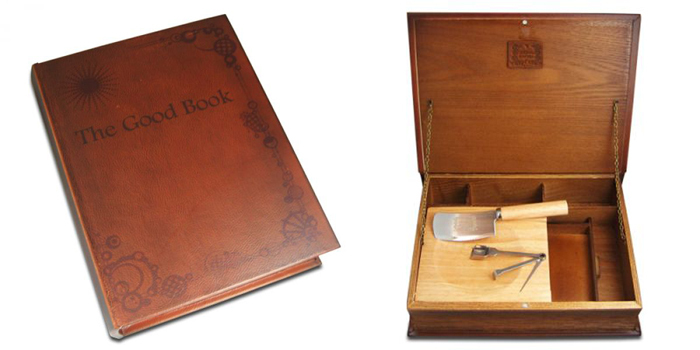 One that we particularly like and we offer in three sizes, small, 22cm x 14cm x 2.5cm, medium 24cm x 15cm x 3.5cm, and our large one at 24cm x 16cm x 4.5cm, all these are in hardback and each is individually handmade. 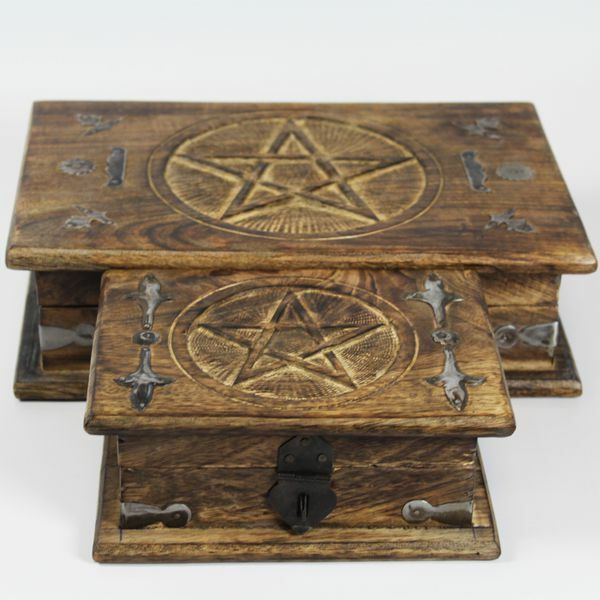 What distinguishes these stash safes from others is that they are actual books with a pit that has been carved out, allowing plenty of room for valuables. Because these are real books, when they are located on the bookcase or shelf, they will be completely indistinguishable from the real thing, they are the real thing of course with just one subtle exception, they are a safe, perfect for storing cash, credit cards jewellery, you can even keep your passwords in there instead of the obvious notebook next to the computer! The hardback book safe is not going to break the bank either, the smallest of the three is £14.99, medium £16.99 and the largest is just £18.99.